So, what is it? Think of it as outsourcing your boring, repetitive marketing tasks and lead follow-ups to software, rather than employees. And because software is infinitely more powerful at data crunching than humans ever could be – and never calls in sick – you can accelerate the lead generation/nurturing aspects of your business exponentially. Want to automatically tag your buyers and put them into an email sequence focused on upselling? How about sending out a discount code to subscribers who have visited your product page multiple times, but have yet to buy? Need to see who your most engaged leads are so you can offer them an incentive? With a quality marketing automation platform, you can do all of the above, and so much more. 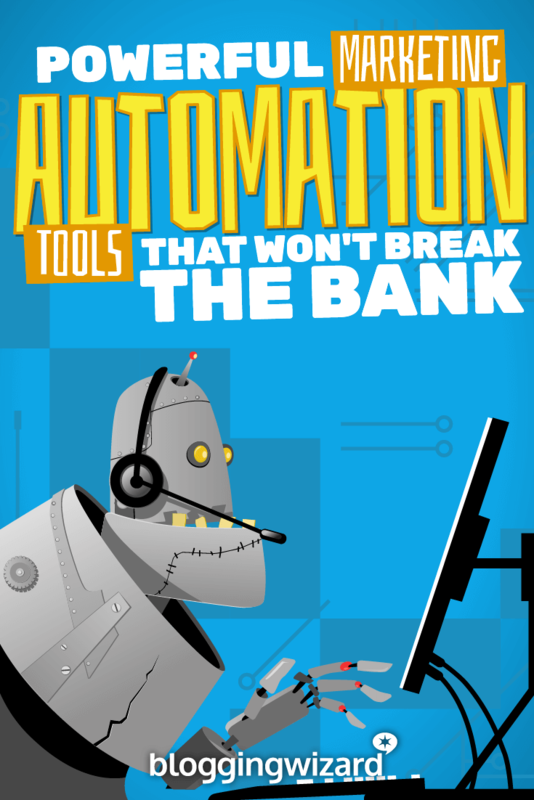 Let’s take a look at a bunch of automation tools that are affordable, yet still powerful and easy to use for the small business or solopreneur. While everyone seems to be talking about ConvertKit lately, Drip has been providing a similar service for years and was recently bought up by Leadpages. Setting up a multi-day drip email course is a simple process with Drip and with over 15 automation triggers and actions available, you can automate almost anything you can think up. 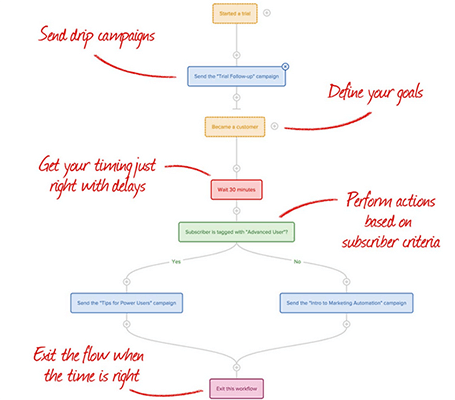 To help you put those plans into action, Drip features an easy to use visual workflow builder that lets you design your marketing logic in a simple point and click format. Every time an existing subscriber visits your website, engages with your content, or opens or clicks one of your emails, Drip’s lead scoring algorithm adjusts the subscriber’s lead score. They integrate with most of the popular email list building plugins like Leadpages, OptinMonster, Thrive Leads and many more, but Drip also has lead capture functionality built in. You can choose from a variety of embedded forms, popup boxes and even slide-in and exit intent opt-ins. Drip has a free Starter plan for under 100 subscribers, but most users will end up on the Basic plan at $49/month for up to 2500 subscribers or the Pro plan at $122/month for 5000 subscribers. Discounts available if paid annually. Another company that’s been around for many years, quietly providing quality marketing automation services to small businesses, is ActiveCampaign. As marketing automation has come into its own over the past few years, ActiveCampaign has evolved to become a popular, much more affordable alternative to the automation giants like Infusionsoft and Ontraport. When compared to many of its competitors in the same price range (and higher), ActiveCampaign simply has more overall functionality. One thing to keep in mind, though, is that while the interface is clean and usable, it can be overwhelming until you learn the platform. What makes ActiveCampaign different? For starters, they include a full CRM toolkit so you can engage with valuable leads all the way from initial contact to deal completion. This is something normally found in more expensive platforms like Infusionsoft. 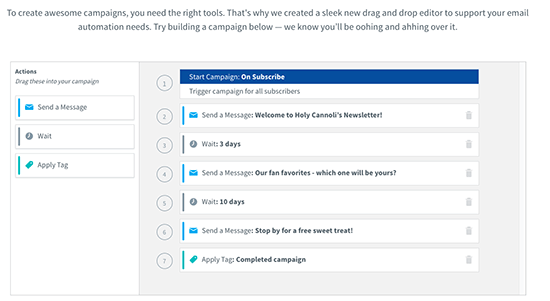 ActiveCampaign does a lot of awesome stuff, but the primary benefit is that we’ll be able to understand and segment the people that have signed up for the different email lists we have. By adding a small piece of HTML code to your website, ActiveCampaign can track visitors as they make their way through your site, allowing you to tag, segment and email visitors based on how they interact with your content. When you consider all that it offers, one of the best things about ActiveCampaign is its affordability. If you don’t need the CRM functionality, pricing starts on the Lite plan at $9/month (billed annually) for up to 500 subscribers. If you do need the CRM, pricing starts at $55/month (billed annually) for up to 1000 subscribers/contacts. GetResponse – along with Aweber – is one of the pioneers in the email service provider (ESP) space. Although they originally didn’t have sophisticated marketing automation capabilities other than an autoresponder, they have recently added a powerful feature set that rivals many of its competitors. In GetResponse’s new marketing automation functionality, you can design your workflows with drag-and-drop ease. Automations can be triggered based on a user’s behavior – things like clicking a link in an email, visiting a webpage, or even abandoning a shopping cart. What’s great is that GetResponse provides many key features at no additional cost. You’ll find lead scoring, tagging and lead filtering all customizable on any number of criteria. GetResponse features hundreds of newsletter templates, stock photos, and suggests the best times to send your campaigns to maximize conversions. A GetResponse account with basic automation features starts at $10/month for 1000 subscribers, but to take advantage of the full marketing automation suite, you’ll need a Pro account that starts at $32/month for up to 5000 subscribers. Discounts available if paid annually. Unlike the more email-focused marketing automation tools like Drip, ActiveCampaign, and GetResponse, Wishpond is a platform that can cover a large portion of your marketing needs. Along with powerful marketing automation capabilities, Wishpond lets you create landing pages, capture leads with forms and popups and run social contents and promotions. Their marketing automation features are similar to other platforms and include personalized emails, lead scoring, drip campaigns, strong integrations, and real-time analytics. Wishpond allows you to get a comprehensive overview of each lead in your database. From here you can see a chronological list of the pages they have visited and how they have interacted with your emails. One highly useful feature Wishpond has is that it allows you to track visitor activity individually and anonymously. Once the lead eventually fills out a form on your website, all of their past and future activity will be tied to their visitor profile. This way, you can start tracking your leads before they even become a lead! For the beginner marketer, the Starting Out package starts at $49/month (billed annually) for up to 1000 contacts and 10,000 emails sent. To access functionality like A/B testing, the API, and for the ability to add custom code, pricing on the Everything You Need package starts at $99/month (billed annually) for up to 2500 subscribers and 25,000 emails sent. By using marketing automation tools to perform lead nurturing and follow-up, you save time and headaches. While Drip, ActiveCampaign, and GetResponse are heavily focused on email marketing, they don’t fall short with their marketing automation features. ActiveCampaign has more overall functionality than Drip, but the additional features like CRM may not be needed in your business. GetResponse has been in the email game for a long time and has earned a solid reputation, but their marketing automation is quite new. If you want an all-in-one tool, consider using Wishpond to meet your marketing needs. Not only is there marketing automation built in, but you also have the option to create landing pages and run social contests.